According to a report by the Governors Highway Safety Association and Sam Schwartz Consulting, over 5,000 people were killed in motorcycle accidents in 2015 across the United States – an increase of 10% from 2014. Some of the main causes of these accidents were riding without a helmet and an increase in motorcyclists riding while impaired. 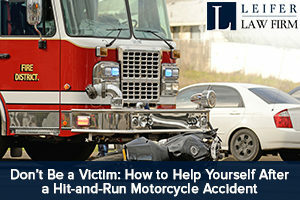 If you have been injured in a hit-and-run motorcycle accident, you should know what to do right after the incident and avoid becoming a victim, or another statistic. As in any other accident, the first thing you should do after a hit-and-run motorcycle accident is gather as much evidence as you can while waiting for the police and emergency responders. This may not be very easy after the shock of such a collision, but it is important to try and remember as many details as you can about the other driver or vehicle – the color or make and model of the vehicle, license plate, the direction the driver was heading, etc. If you noticed any of this information, make sure to note it down as it will be useful in the police report and investigation. If there are bystanders, request them to stay as witnesses and provide the police with statements about what they saw. You should take as many photographs of the accident scene as possible. You should also take pictures of your injuries, no matter how minor they might seem. It is also vital to make sure that you get medical treatment for your injuries, even if they do not look very serious. Keep in mind that some injuries can show symptoms after only a few hours have passed, while others could take days to show themselves. Getting examined immediately after the motorcycle accident can help make an account of your current condition, and any examination that you get later can show the damage in your body after it had time to respond to the trauma. The medical report will be helpful if you file a personal injury claim or lawsuit against the party at fault. Do not sign any paperwork with any insurance company since any monetary amount they offer you will most likely not include your long-term medical bills. How could it? You do not even know how bad this situation is and neither do they. Hit-and-run motorcycle accidents can be more complex than other types of accidents as the party responsible for the accident may not be found immediately. You will need to wait for the police to investigate your accident and trace the driver who caused it. If the driver possesses a valid insurance policy, you can pursue a personal injury claim to obtain compensation from the insurance company. If the driver does not possess have any insurance coverage, you can file the compensation claim through the Uninsured Driver Scheme of the Motor Insurer’s Bureau (MIB). If, in your case, the driver at fault cannot be traced, you can approach the MIB to help with your claim. You should have the assistance of a reliable and solid personal injury attorney to help you with your claim. You must always keep in mind that insurance companies will try to ensure that you recover little or no compensation for your motorcycle accident injuries. If you or a loved one has been injured in a hit-and-run motorcycle accident, you should immediately call a personal injury lawyer to handle your case. At the Leifer Law Firm, we have the experience to help you get the compensation you deserve for your injuries and other damages. Call 561-660-9421 today for a free consultation.